The summer months are meant to be enjoyed outside, which is why riders opt for taking their motorcycles for a spin during this time of year. However, the high temperatures, blazing sunshine, and extreme heat can make these thrilling rides a bit dangerous. To keep yourself protected while you ride this summer, read and follow the tips below. Keep your motorcycle ready for the summer with AMSOIL products. Call John O Brown at (520) 444-2634 to order the best synthetic oil in Tucson. One of the worst things about summer is the amount of sweat that comes with it. Unfortunately, sweating more means that your water levels are lowering more than usual, which could lead to dehydration. That's why it's important to stay as hydrated as possible, especially if you'll be outside riding your motorcycle. The recommended intake is 8 glasses of water a day, though this will depend on your activities and how much you sweat. Speaking of dehydration, it isn't the only danger you may encounter if you ride your motorcycle during the summertime; you could also suffer from heat stroke or another related ailment. That's why it is important that you listen to your body to detect the early signs of these conditions, so you can act on them promptly. For example, if while riding, you feel dizzy, nauseous, feverish, or extremely fatigued, stop, seek shade, and drink enough water. Likewise, visit your doctor for good measure. When the heat is particularly gruesome, you may not want to wear your helmet, or any other protective gear. However, that is a big mistake, since you'll be putting your safety at risk. Your best bet is to continue riding with the necessary gear and find light fabrics that are also impact-resistant, so you can remain covered from the sun, protected if there's an accident, and fresh as you ride. Speaking of wearing the appropriate protective gear, you should don your eye-wear if you'll be riding under the sun. As you know, the intense summer sunshine can blind you or impair your vision, preventing you from accurately seeing the road, people, cars, and objects around you. To avoid a terrible mishap, wear sunglasses with UV protection (if your helmet doesn't come with a face shield), so your vision doesn't suffer. 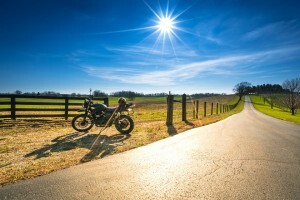 The summer heat and sun can do more than inconvenience you while you ride; they can also take a toll on your motorcycle. For example, the tires, the engine, the cooling system, and other integral components can be affected by the harsh conditions. So, if you don't want to be stranded on the road during the harsh summer months, it's imperative that you take your motorcycle to a professional mechanic who can guarantee it will endure. AMSOIL 20W-50 Synthetic V-Twin Motorcycle Oil can protect your motorcycle's engine through the harsh conditions. Call John O Brown at (520) 444-2634 for more information. If you're one of those people who only rides their motorcycle during the summer months, it may be a good idea to refresh your memory in a safe space before you start taking it to the road once again. This way, you will be reminded of how to drive your motorcycle, how it works, what rules to follow, and more. Your could even sign up for motorcycle lessons to be safe. Road rage can happen at any time, no matter what time of year it is. However, it is more likely to happen during the summer months, since people get hot and bothered with the high temperatures. The thing is, road rage can lead to mistakes and dire consequences. To avoid it as much as possible, Allstate recommends taking it easy, planning ahead, and analyzing your driving. The weather in Arizona is no joke, which is why you should keep it in mind if you'll be outside, riding on your motorcycle. Checking the weather before you leave can alert you of especially high temperatures or heat waves, which could result in dehydration or other ailments. Likewise, summer is the wet season in some places, so try to be aware if the conditions will be bad while you ride. Stop by AMSOIL's online store, or call John O Brown at (520) 444-2634 to purchase the best synthetic oil in Tucson for your motorcycle.